Beautifully engraved certificate from the drugstore.com issued in 2001. This historic document was printed by the American Banknote Company and has an ornate border around it with a vignette of the company logo. This item has the printed signatures of the Company’s Vice President and Chairman of the Board. drugstore.com, inc. (Nasdaq: DSCM) is a leading online retailer of health, beauty, vision, and pharmacy products. Their portfolio of brands include: drugstore.com(TM), Beauty.com(TM) and VisionDirect.com(TM). All are accessible from http://www.drugstore.com and provide a convenient, private, and informative shopping experience while offering a wide assortment of more than 30,000 products at competitive prices. 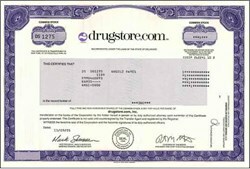 The drugstore.com pharmacy is certified by the National Association of Boards of Pharmacy (NABP) as a Verified Internet Pharmacy Practice Site (VIPPS) and operates in compliance with federal and state laws and regulations in the United States.